Quick demo of the cool new Ticker for Twitter iPad app. I heard about the Ticker for Twitter iPad app a couple weeks before it was released, and thought it sounded quite promising. It was recently released in the App Store and today I installed it and have been using it all morning. It’s described as a passive Twitter client and I like what it does – which is show you a continuous stream of your Twitter timeline in a nice full screen view. I find I’m noticing more tweets this way than I would generally do when I have to switch over to Tweetbot on my Mac or iPad. Check out my quick video review above for more thoughts and to see it in action. 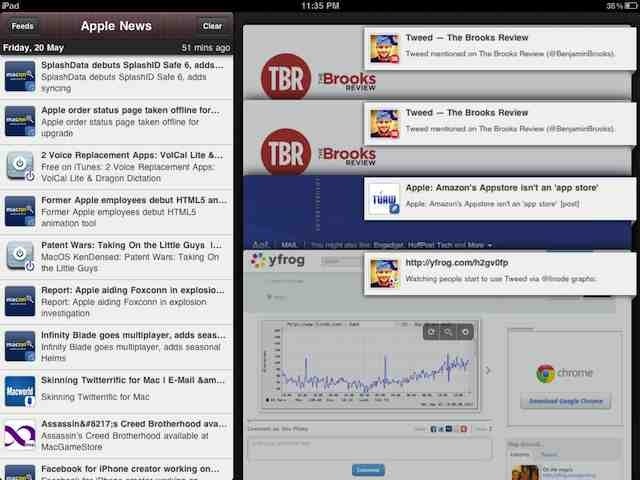 Here’s an App Store link for Ticker for Twitter; it’s priced at $1.99 and is a universal app for both iPad and iPhone. Tweetbot for iPad, the popular and gorgeous Twitter client for the iPad, is on sale right now at nearly 70% off its standard price. It’s down from $2.99 to just 99 cents. The sale is said to be ‘for a very limited time’ and is timed nicely to coincide with yesterday’s update to the official Twitter app for iPad. Tweetbot boasts a beautiful and elegant to use interface, and has been my favorite iPad Twitter app just about ever since it came out early this year. This price drop is the first one I’ve seen for the app, so this is a great opportunity to grab an excellent iPad Twitter app at a bargain price. 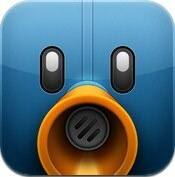 Here’s an App Store link for Tweetbot for Twitter (iPad). I’ve only spent a short while with the new version of Twitter for iPad, so I really don’t have much to say by way of first impressions as yet. I don’t think it matches Tweetbot as yet, but it is good to see the app get a little more ambitious update than it has had in quite a while. I wish Twitter would change their stance on no longer updating their Mac app, and also on their policies that seem dead set against 3rd party Twitter apps. I’m definitely in the camp that believes 3rd party apps have been a huge part of Twitter’s success and they should be looking to increase their support for them, not erode it. 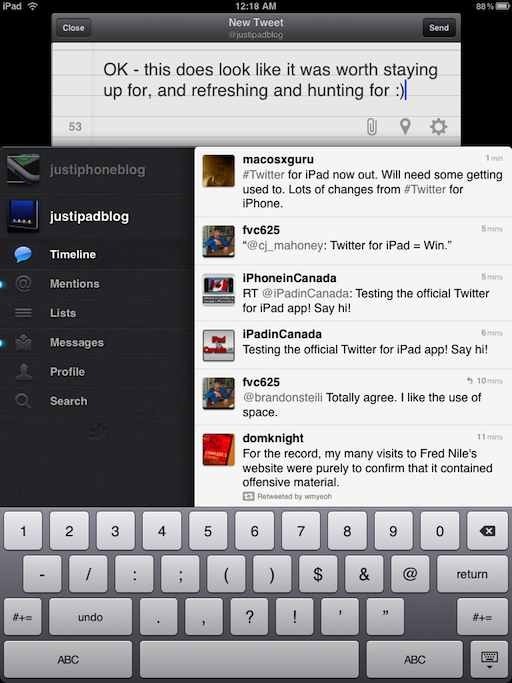 For those of you who have updated to this new version of Twitter for iPad, what do you think of it? What’s your favorite iPad Twitter app? 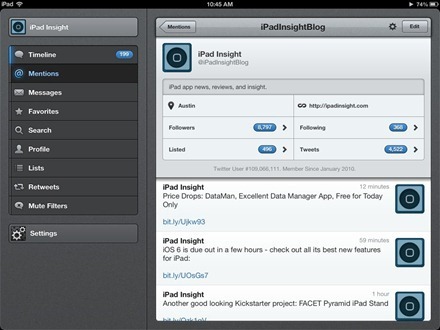 Here’s an App Store link for Twitter for iPad; it’s a free app. 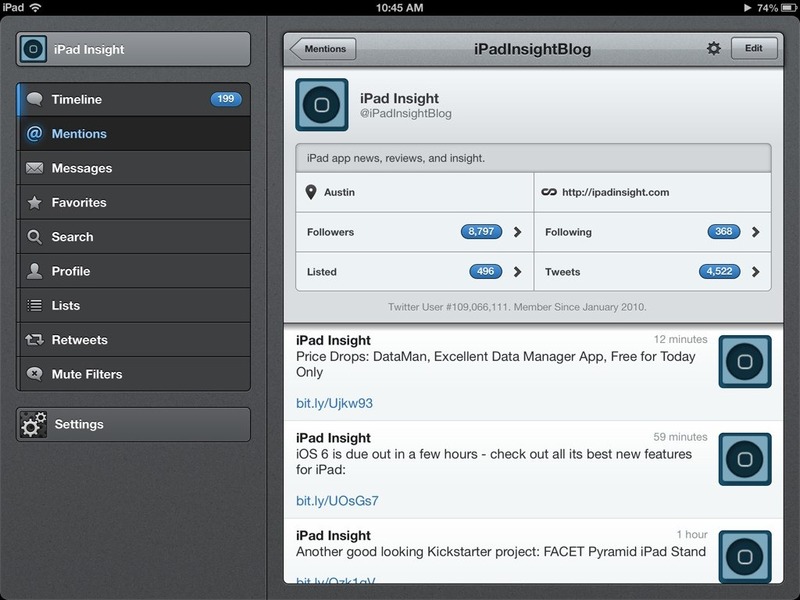 Tweetbot for iPad has been released today, and is available in the iPad App Store now. Tweetbot for iPhone has been around for a while now and has garnered a lot of praise and popularity – so many of us have been looking forward to seeing the app come to the iPad. 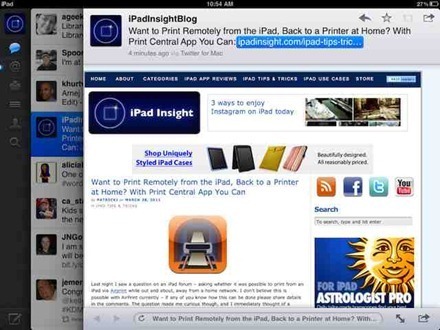 ◆ Support for multiple services like Read it Later, Instapaper, Cloudapp URL Shortening. ◆ Save drafts, add locations and POI’s, attach photos/videos, manage your lists, and much more. I’ve only just installed the app a short while ago – but I can already say it looks great. It’s got a wonderful UI and feels good to use already. Here’s an App Store link for Tweetbot for iPad; it’s priced at $2.99. Any Tweetbot for iPad users here? If so, what are your thoughts on it so far? 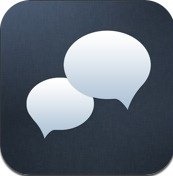 I tried it out last night, and I think it’s quite an interesting and promising app. Twitter is very often the best place to spot all the freshest breaking news, whether it’s about a war, a natural disaster, or just some exciting technology news. Tweed makes it easier to use Twitter to just follow news. It’s definitely not a replacement for your favorite Twitter app, but it’s very useful for those of us who see Twitter as a great news resource. Twitter, the official Twitter app for the iPad and iPhone, has been updated this week – and has added the ability to launch links in tweets in an inline browser. There are no other notable changes in this latest update, to Version 3.3.4 – just unspecified accessibility improvements and bug fixes. The new link launching feature is quite a nice one. It’s certainly a quicker way to see if a link is interesting when it’s a shortened link and the tweet text doesn’t reveal much about it. 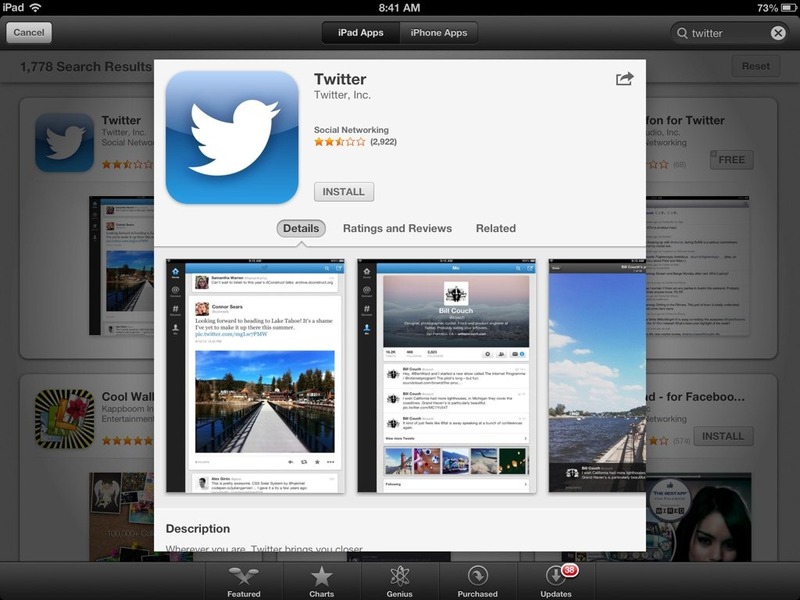 Here’s an App Store link for Twitter; it’s a free app and a universal app, designed to work on both iPad and iPhone. The official Twitter app for iPad and iOS got another update yesterday, to Version 3.3.2. The big new feature is support for uploading photos and videos taken with the iPad 2 along with your tweets. — First I tried one of just under two minutes in length that was already in my Camera Roll on the iPad 2. This took ages (8-9 minutes) to upload and show the tweet, then another few minutes to process the video on yfrog.com. 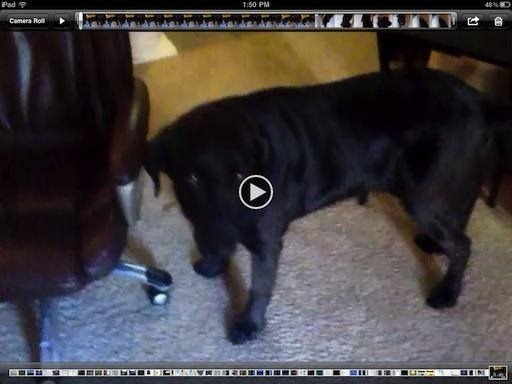 — Then I shot a quick video of my huge, lovable Labrador with the iPad 2 straight out of the Twitter app. This one was only just over 10 seconds and both it and the tweet it was attached to uploaded almost instantly. The official Twitter app for the iPad and iPhone has had an update today, to Version 3.3. – Cleaner, redesigned Tweet compose screen. – Automatically shortens URLs. Just paste them in and they will only count as 20 characters, no matter how long they are! I haven’t spent long enough with the updated app to have any big thoughts on it yet. If you have, please share them in the comments. Here’s an App Store link for Twitter, it’s a free app. Osfoora HD is my joint-favorite Twitter app for the iPad (and iOS as a whole) along with Twitter. I’m glad to see it getting up to speed with 4.2 and also looking forward to seeing its upcoming Mac version. You can find the latest version of Osfoora HD in the App Store now, priced at $3.99. 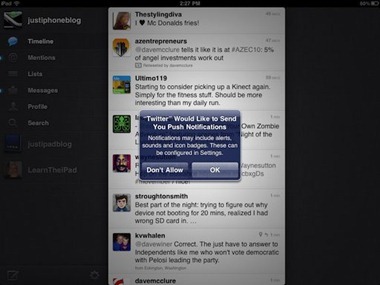 Twitter – the official Twitter app for iPad and iPhone – has been updated, to Version 3.2.1. The biggest addition is push notifications for @mentions and messages. It’s really about time this feature hit the official Twitter app, since several third party apps have been doing this for some time now. … it’s easier to flip your way back to the “root”, and a selected tweet no longer stays pinned to the top of the list as you scroll down. You can find the latest version of Twitter in the App Store now, and it remains a free app. 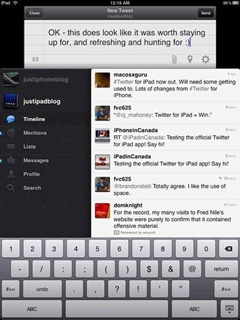 Twitter for iPad was released late last night. This is of course the official app from Twitter themselves and, more importantly, the creation of Loren Brichter – the developer of the excellent Tweetie app, which was bought by Twitter. Like many folks round the web – and seemingly 90% of the Twitterverse – I stayed up late last night once I heard it was going to be released, and played the patience-testing game of near constant App Store refreshing until I managed to download it. Seriously, @atebits has a mastery of the iOS SDK that just boggles the mind. Incredible job on the iPad Twitter app.